Background Steroid-sensitive nephrotic syndrome (SSNS) is a childhood disease with unclear pathophysiology and genetic architecture. We investigated the genomic basis of SSNS in children recruited in Europe and the biopsy-based North American NEPTUNE cohort. Methods We performed three ancestry-matched, genome-wide association studies (GWAS) in 273 children with NS (Children Cohort Nephrosis and Virus [NEPHROVIR] cohort: 132 European, 56 African, and 85 Maghrebian) followed by independent replication in 112 European children, transethnic meta-analysis, and conditional analysis. GWAS alleles were used to perform glomerular cis-expression quantitative trait loci studies in 39 children in the NEPTUNE cohort and epidemiologic studies in GWAS and NEPTUNE (97 children) cohorts. Results Transethnic meta-analysis identified one SSNS-associated single-nucleotide polymorphism (SNP) rs1063348 in the 3′ untranslated region of HLA-DQB1 (P=9.3×10−23). Conditional analysis identified two additional independent risk alleles upstream of HLA-DRB1 (rs28366266, P=3.7×10−11) and in the 3′ untranslated region of BTNL2 (rs9348883, P=9.4×10−7) within introns of HCG23 and LOC101929163. These three risk alleles were independent of the risk haplotype DRB1*07:01-DQA1*02:01-DQB1*02:02 identified in European patients. Increased burden of risk alleles across independent loci was associated with higher odds of SSNS. Increased burden of risk alleles across independent loci was associated with higher odds of SSNS, with younger age of onset across all cohorts, and with increased odds of complete remission across histologies in NEPTUNE children. rs1063348 associated with decreased glomerular expression of HLA-DRB1, HLA-DRB5, and HLA-DQB1. 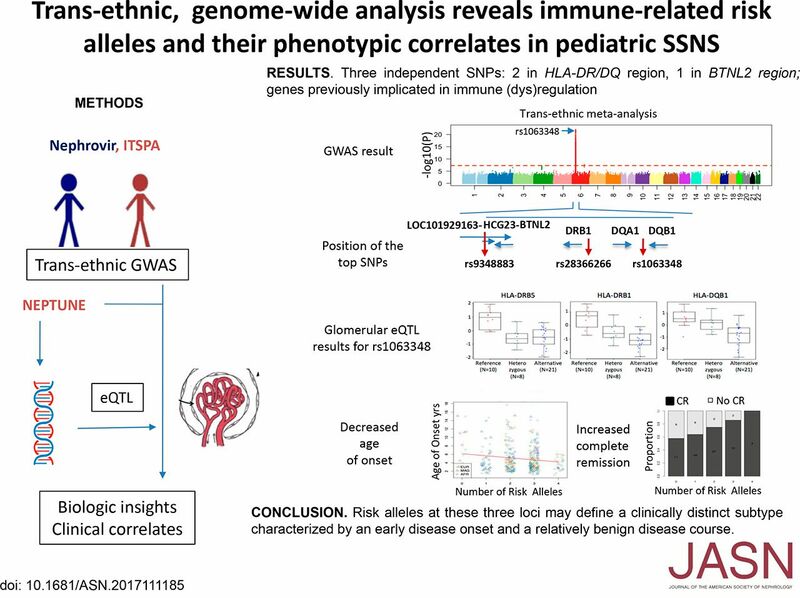 Conclusions Transethnic GWAS empowered discovery of three independent risk SNPs for pediatric SSNS. Characterization of these SNPs provide an entry for understanding immune dysregulation in NS and introducing a genomically defined classification.